Photo: Interpretive panel at Larb Hollow Overlook. Eastern Mojave Vegetation Interpretive panel at Larb Hollow Overlook. Ellen Thompson, wife of A. H. Thompson and sister of John Wesley Powell, served as botanist on the second Powell Expedition. She collected hundreds of plants, many of them new to science. Several were named in her honor, including Thompson's Penstemon (Penstemon thompsoniae) and Thompson's Woolly Locoweed (Astragalus mollissimum var. thompsoniae). Mount Ellen, in the Henry Mountains, is also named for her. “… as far as the Eye can see a naked barren plain of red and white Sandstone crossed in all directions by innumerable gorges …” -- Franklin B. Woolley, Andrus Expedition, 1866. Several years before the Powell Expedition, the Andrus military expedition patrolled the Aquarius Plateau region, providing the first written descriptions of this area. By 1870, the continental United States had been mapped and surveyed, except for one area -- the vast region that surrounds you. From the Colorado River to the Aquarius Plateau, and from the Virgin River to the Green, this rugged landscape was uncharted territory. Though the Fremont Expedition passed through Capitol Reef during the winter of 1853-54, they were desperately low on provisions and did not linger to survey the region. In 1872, John Wesley Powell launched his second expedition down thw Green and Colorado Rivers to chart the Rivers and surrounding lands. Over the next four years, his brother-in-law, Almon H. Thompson, led the land survey of southern Utah, during which he explored and charted Boulder Mountain and the rest of the Aquarius Plateau. 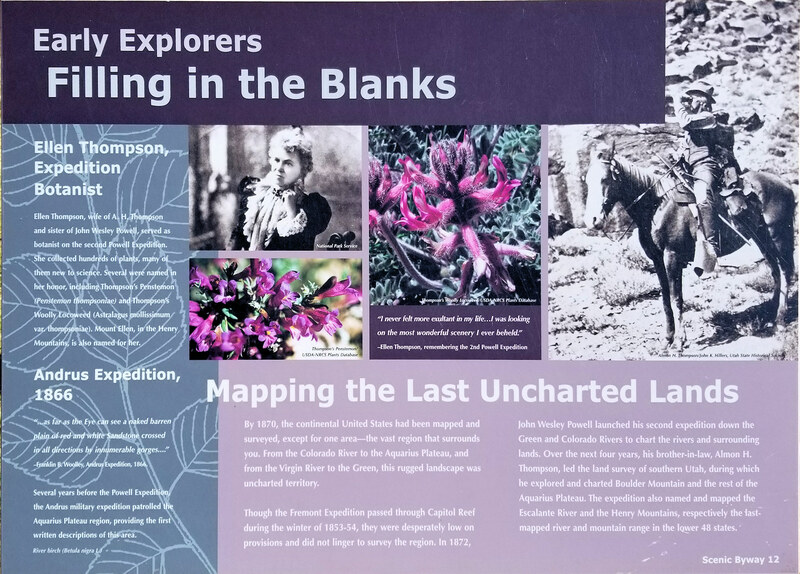 The expedition also named and mapped the Escalante River and the Henry Mountains, respectively the last-mapped river and mountain range in the lower 48 states. Field Notes: 8 Oct 2017. Utah Highway 12: at Larb Hollow Olook. Other photos about Geography - Utah or Boulder Mountain.